After a week of anticipation, the titan arum opened on Sunday. On a typical day at the U.S. Botanic Garden it's very easy to stop and smell the roses. On Monday, however, the line to enter wrapped around the corner and halfway down the block. 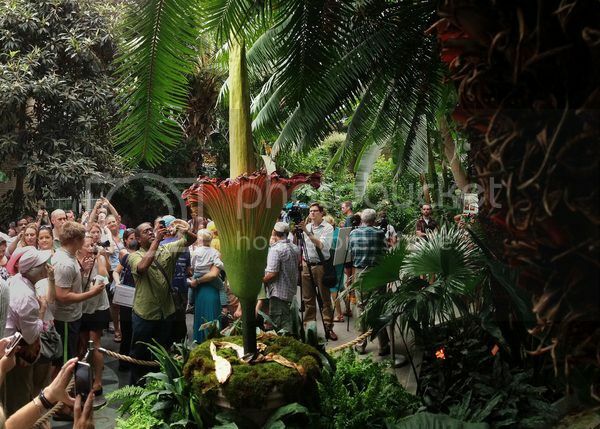 Floral fanatics and curious office workers alike came to see Washington, D.C.'s most famous plant: an 8-foot-tall (2.4-meter-tall) corpse flower named Andy who was supposed to smell like a dead body. Andy, short for "androgynous," is a titan arum corpse flower who is native to parts of Indonesia. It was brought to the U.S. Botanic Garden in anticipation of its landmark bloom, which only takes place every eight to ten years. In addition to being unpredictable, the bloom is heralded for its unique smell, which resembles rotting flesh, a dirty diaper, or fermenting vegetables—depending on whom you ask. The rank stench is even more of an attraction because it only lasts less than half a day after the flower blooms. This unique odor is what drew crowds to the glass building, not far from the U.S. Capitol. Unfortunately, Andy had terrible timing—its hours of stench occurred while the garden was closed, with nobody to witness except a few employees. "I'm sorry I missed out on the aroma," said George Mika of Lyndon, Virginia, who drove 70 miles (113 kilometers) to take a whiff. Like many others, Mika had anticipated the stench of a lifetime, but was met instead with nothing more than the faint body odor of sweaty humans in a hot greenhouse.